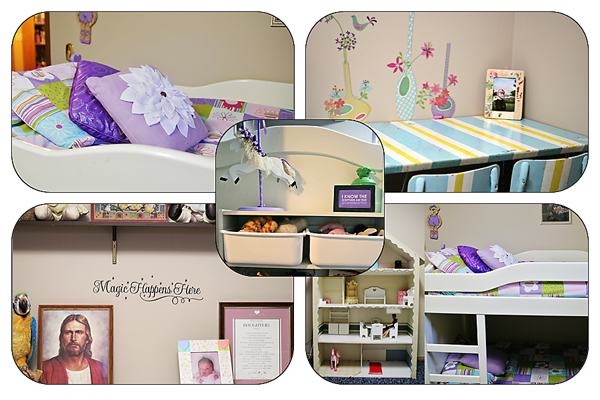 Room Make-Over #2 – It Works For Bobbi! Published on January 20, 2011 August 9, 2016 by Bobbi-Jo G.
A dark, dark, dark – almost BLACK – midnight blue. It used to be a workout room for the previous home owner, and we hated it. When my in-laws came for Christmas, they went to work repainting the bedroom, which was no small task. 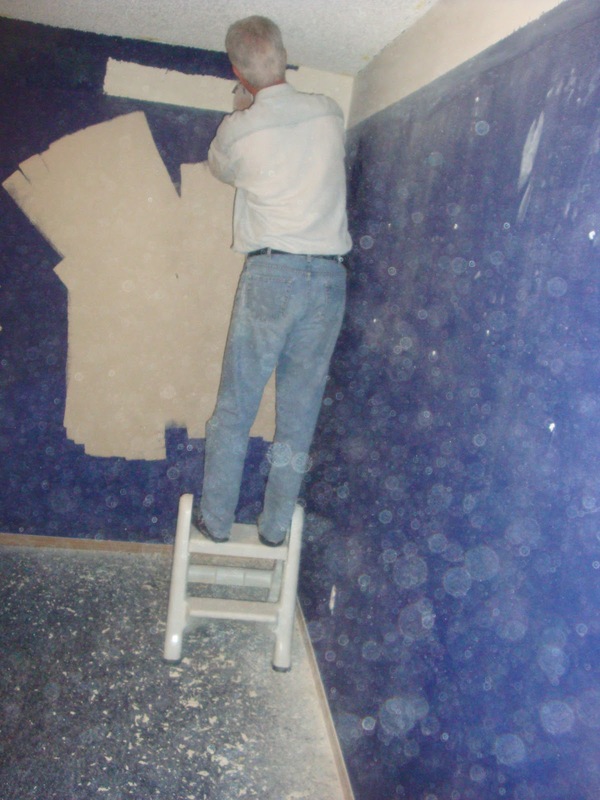 It involved scraping off the stippling that was on the wall, sanding, mudding, and painting. But it was SO worth it! 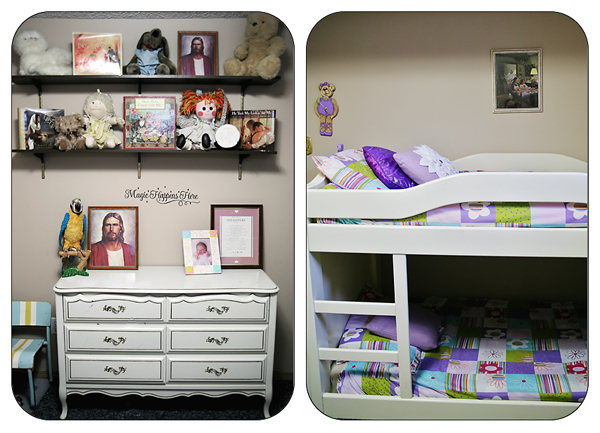 Now the girls have a light and airy – and FEMININE – room. We went with a light rosy-tan color for the walls, and found some adorable bedding at JYSK for a great price. I found some new purple throw pillows at Value Village (in their new section), which I dressed up with some Felt petals, like I did in my livingroom before. I also added some fun little decals to the wall by their craft table (from the dollar store) to brighten the space. I also added some black vinyl lettering above the dresser to add some magic to the space. The room is still in progress, though. I want to add a large round mirror with a white frame above the craft table, as well as add some pretty curtains and perhaps a large round area rug for the middle of their carpet. But, I’m loving the difference so far! It’s amazing what a difference some paint can make. I love the change, and the girls have done so much better keeping their room clean, which is hard when you are 4 and 6 year old girls! What do you think could be added to this space to make it even better? I’d love your input! On one blog I read to have pictures of them when they were little being loved/ cuddled. So I did that, and they love seeing when they were babies and being held or kissed by mom or dad. You've inspired me to check out the vinyl at the dollar store. It looks great! What a difference paint makes. 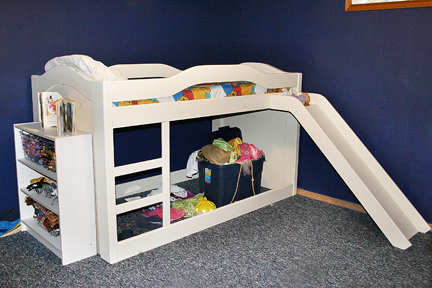 I would have loved that bed as a kid. Oh wow! another bedroom makeover. Your girls must love thier new room. It is amazing what a lighter color paint on the walls can do. The white furniture is so pretty and I love that they have a very pretty craft table and chairs to match. It was nice of your in-laws to help with the painting. My goodness you are so creative. Everything that you have done right down to the smallest detail is beautiful. I love the vases! That's such a great idea…so cute and they don't take up any room! I'm all over that idea. Where did you find them? Where did you get their bed? My husband and I are looking for something similar for our daughter's room.